I am the President and co-founder of Dharma Voices for Animals (DVA), a non-profit organization, originating in San Diego, California, USA. We have over 760 members worldwide in 40 countries. Our mission is to give meaning to the Buddha’s teachings by being the voice for animals in Buddhist communities throughout the world. 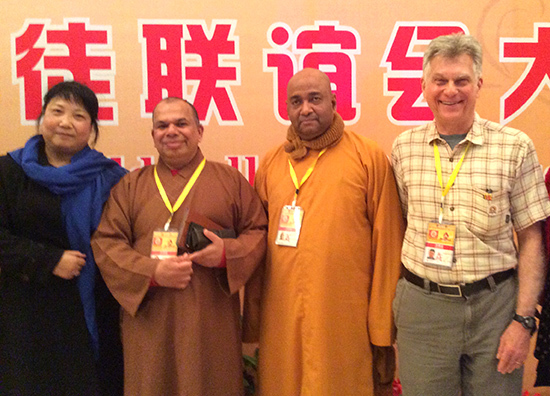 The World Fellowship of Buddhists’ 27th General Conference in Baoji, China, at the Wanfu Quixing Star International Hotel, was held from October 16-18. The theme of the conference was “Buddhism and Public Charity.” I was there as the delegate of DVA. 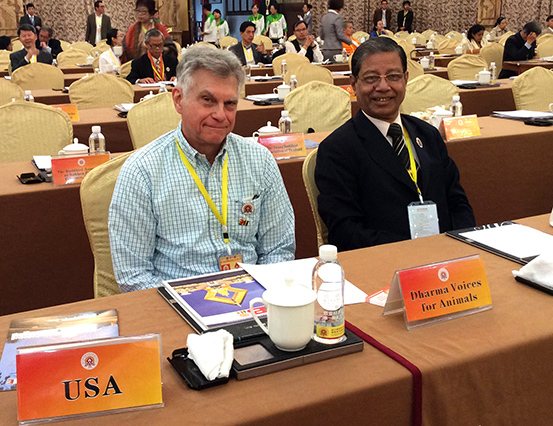 On Friday, October 17, DVA was admitted into the WFB as a Regional Centre. I join all of my colleagues at Dharma Voices for Animals in expressing our deep gratitude to the WFB for admitting us to the most prestigious international Buddhist organization in the world. I also want to express my deep gratitude to the late Dr. Ananda Guruge, who was my friend and mentor and who, at the time of his death, was acting as the Honorary Vice President of WFB and was largely responsible for DVA joining WFB. On Thursday, October 16, the more than 600 delegates from 30 countries and regions around the world were escorted on a day-long, extensive tour of the world-renowned Famen Temple, located in Fufeng County in Shaanxi Province in northwest China. The temple was built in the second century, which included the magnificent 1700 year old Hidden Temple, discovered by accident in the 1980’s. The media coverage was huge with hundreds of reporters covering the events. The impressive opening ceremony was held in the Famen Temple and attended by Chinese officials ranking as high as the Secretary of the Secretariat of the Chinese Communist Party Central Committee, Du Qinglin, and the Director of the State Administration for Religious Affairs, Wang Zuoan. Buddhist leaders from throughout the world gave opening speeches and read addresses by the Presidents of Sri Lanka and Nepal, the King of Thailand, and the President of the State Sangha Committee of Myanmar. The night (October 15) before we were all treated to a lovely spectacle of Chinese songs, dances, and colors in a huge theater in the Wanfu Hotel with a standing room only crowd. As a practicing vegetarian (my diet is completely plant-based), I was so happy to find that at every meal, eleven in all, an entire room of delicious, interesting, and healthy vegetarian food awaited us. At every breakfast, lunch, and dinner, a breathtaking display of colors, tastes, and smells greeted our entrance. Fresh vegetables and fruits, bean curd (tofu), noodles, rice, sauces, salads, soups, and drinks were brilliantly displayed on large tables stretching from one end of the spacious room to the other. It was in this room that hundreds of us shared compassionate, non-harming, and healthy meals. Our Chinese hosts demonstrated that when it comes to vegetarian catering, they are world class. This resolution would establish a Standing Committee, “based on the Buddha’s First Precept of the Pancha Sila, the Noble Eight Fold Path, the Karaniya Metta Suttra, and in line with the overall teachings of the Buddha,” with the purpose “to give voice to the suffering of animals and draw the attention of Buddhists and Buddhist countries to their plight and recommend measures to eliminate or reduce their suffering. It will support the enactment and/or updating of animal welfare legislation in Buddhist countries” and in specific situations “prepare policy papers for release by the WFB reminding Buddhists that the Buddha extended compassion and non-harming to all sentient beings”… “This step of the WFB in moving toward animal welfare and protection is long overdue for the premier world Buddhist organization.” DVA vigorously supported this resolution. This resolution together with two other resolutions proposed by Senaka Weeraratna calling for the establishment of two other standing committees: one for conflict resolution and one for Buddhism on the internet were accepted in principal by the Chairman, the Venerable Dr. T. Dharmaratana Thero. But, the Chair said it was not desirable to increase the number of committees over the eleven that now exist and that perhaps the work of the newly proposed committees can be done within existing committees. 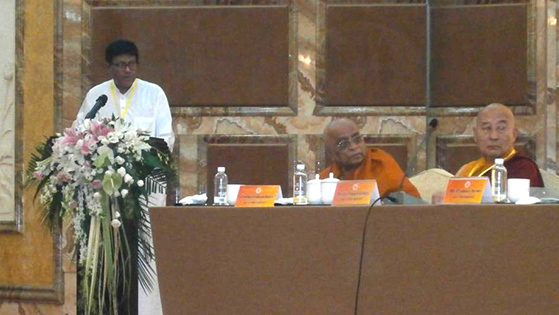 The WFB General Council (entire membership) unanimously approved a resolution by Jagath Sumathipala from Sri Lanka that the Constitution be amended to allow the WFB to address threats and challenges to global Buddhism by way of a committee. The theme of the conference, Buddhism and Public Charity was addressed at a symposium in the early afternoon of October 17. A series of papers were read highlighting groups of Buddhists engaged in public charity and disaster relief in China, Japan, Bangladesh, South Korea, etc. One group that stood out was the Tzu Chi Foundation of Taiwan. I met with representatives of Tzu Chi in their Taipei offices on October 20, 2014, to discuss matters of mutual interest, and appeared on their television network that night. During his keynote address, Ven. Phra Shakyavongsavisuddhi (Dr. Anil Sakya) Thero, a Napalese monk, living in Thailand, spoke about the theme of the conference. At the meeting of the Standing Committee on Humanitarian Services held in the late afternoon of October 17, the German Dharmaduta Society and DVA co-sponsored a proposal that was approved without any dissent to rename that committee as the “Humanitarian Services and Animal Welfare/Rights Standing Committee.” At the second plenary session, the proposal to rename the Committee was submitted and accepted by the WFB General Council. Our proposal will now be taken up by the Executive Committee for a final decision. 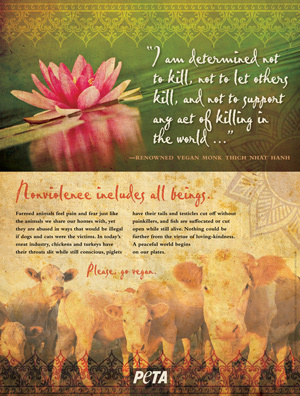 Although it is undisputed that animals need an effective voice in the international Buddhist Community, currently the WFB has no committee or other vehicle to promote the Buddha’s teachings of non-harming and compassion for animals. 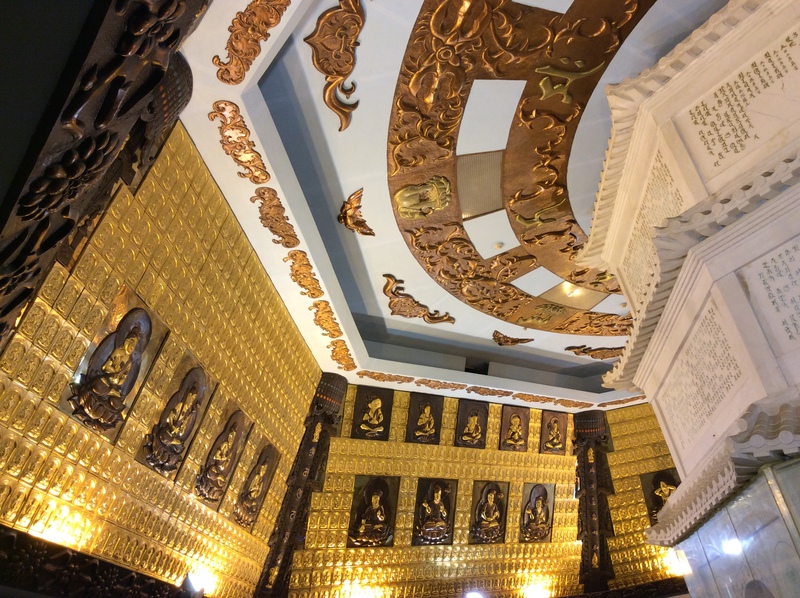 At the closing ceremony on Saturday, 18 October, one of DVA’s biggest supporters, Master Hai Tao of Taiwan, gave a speech of cooperation in carrying forward the Buddha’s message. WFB Secretary-General Phallop Thaiarry read the final declaration of the conference, stating among other things that, “We vow to work with all human beings to achieve human happiness through a kind heart; social harmony through respect; world peace through reconciliation; and to promote goodwill through fellowship.” Dharma Voices for Animals and its friends and supporters will work to extend this goal to achieve happiness for “ALL LIVING BEINGS” consistent with the teachings of the Buddha. The WFB Conference gave me the opportunity to visit the People’s Republic of China for the first time. I want to express my deep gratitude to the many donors at DVA that made this trip possible. During my days in Xian and Baoji, I found the Chinese people to be kind-hearted, friendly, and extremely generous. I was also deeply impressed by the community effort supporting the WFB conference in Baoji. The event was organized through the joint efforts of the Buddhist Association of China (BAC), the Shaanxi Organizing Committee, and the Baoji Organizing Committee. The entire event was wholeheartedly supported by the Central Government of China. I will also remember the stream of hard working, friendly, and selfless, young volunteers, most of them from the local university. It was a magnificent display! I felt welcomed and cared for in the Buddhist spirit. My heart was warmed when I saw many examples of the extent of Buddhist culture and practice alive and well in China. China is home to the largest Buddhist population in the world and has a rich history of 1700 years of Buddhism. I had an excellent experience at the conference and hope that the seeds we planted with hearts of loving-kindness and compassion for all beings, as extolled by the Buddha in the Karaniya Metta Sutta, will bear an abundance of fruit in the coming years. President of Dharma Voices for Animals, a WFB Regional Centre. Animals have the right to live freely and peacefully until their natural death, same as humans as this planet is belongs to all of us.